On the 5th of February a meeting was held between members of the Wedderburn CMN and members of the Victorian Malleefowl Recovery Group (VMRG). Two of the objectives of the meetings were; firstly a revision of the alignment of the work of the WCMN with the National Malleefowl Recovery Plan and secondly discussion of the coordination of line searches for malleefowl mounds in the Wychitella NCR. At the conclusion of the meeting it was decided that the VMRG should coordinate such searches to avoid duplication of effort and to ensure that data collected was recorded on the national database. Prior to this meeting Dr David Baker- Gabb had prepared a Malleefowl Release Plan for the Wychitella Nature Conservation Reserve and although it is now realised that further research is required before population supplementation takes place, having the plan in place is a distinct advantage. A brief summary of this detailed document is given below. When it is decided that population supplementation will recommence the approximately1 year old Malleefowl, before their introduction into the captive program, and before any releases to the wild, will be subject to veterinary checks. They will then be translocated to a pre-prepared semi-captive facility located on a suitable site in the Wychitella NCR. Four such suitable sites have already been identified. The semi-captive facility will cover c.1ha and be surrounded by a approximately 2m high predator-proof galvanised ‘chicken netting’ fence with a covering of soft ‘bird netting’ supported by 3m tall poles and wires overhead to exclude raptors. The facility will encompass natural Malleefowl habitat with shrubs and trees up to 3m that will allow the young birds to learn to roost well above the ground. 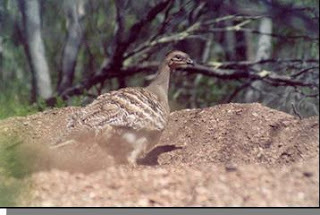 When local conditions are suitable, for example, after a wet Spring, the Malleefowl will be allowed to move out from the semi-captive facility into a surrounding larger approximately 10 ha soft-release site that has an electrified fence surrounding it to exclude mammalian predators. Birds will only be allowed into the outer soft release facility if their weights are similar to or heavier than when they arrived. The young Malleefowl will continue to be fed in this larger enclosure and will be able to fly in and out of it as they choose. The diet for the captive Malleefowl will be the same as that recommended by the Little Desert Lodge and other captive facilities. All Malleefowl will be fitted with a single metal ABBBS leg band and two coloured metal bands so that they can be individually identified in the aviary and field. All captive Malleefowl will be fitted with ‘backpack’ radio-transmitters that have been used successfully on captive-released birds elsewhere. The ‘backpacks’ will be fitted at the start of the bird’s confinement in the captive-release facility at Wychitella, but not activated until their release to the wild, so that any impacts on the birds can be monitored closely and corrected if necessary. Included in the plan are contingency measures for dealing with such emergency situations as distressed bird.